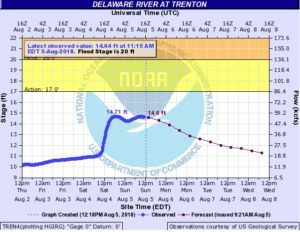 As of 12:30pm on 8/5/2018 the river is at 14.6′ and is not expected to fall below 12′ until sometime on Tuesday 8/7/2018. When the river is at and above 12′ there is NO ROWING. Monitor the flag indicator on this website, and the physical flag posted at the boat side for changes. River gauge can be found here. Special thanks to Tim Norland for providing this view. Note: The higher severity flag on the website or at the launch has precedence.